105 mm L/65 Dop. L. C/378 х 2 pcs. 150 mm L/55 SK C/282 х 2 pcs. 20 mm Flakvierling 388 х 4 pcs. Tirpitz B — German promo premium Tier VIII battleship. 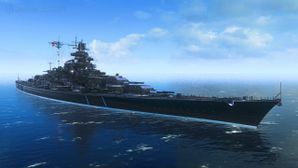 Referred to as the "Derpitz" or the "Torpitz" — due to a large number of inexperienced players choosing to purchase her outright without knowledge of high tier gameplay — Tirpitz is surprisingly flexible for a battleship and can be used as either a proper battleship or as an impromptu battlecruiser. Probably the most surprising thing players will find is that her main battery load time is about 26 seconds, which can be daunting to face. She also has torpedo tubes, useful for when cruisers or battleships get in too close or when the ship is able to work its way into melee range. Her 15-inch guns are the smallest BB guns on Tier VIII battleship (tied with her sister Bismarck), and have not only a high amount of dispersion when firing at maximum to extreme range but will find trouble punching through armor designed to protect against 16-inch shells. However, the smaller caliber means that shells are less likely to overpenetrate cruisers, and when combined with the good turret traverse and reload time (for a battleship), this can make Tirpitz excellent at clearing the battlefield of enemy cruisers. Her AA suite — once considered sub-par — has gone through several rounds of improvements but is still unreliable, and will not save you from a dedicated carrier assault. As a capital ship, she will, of course, still be a priority target for enemy aircraft carriers, and thus captains must be wary of an enemy CV should they find themselves against one. At 30.7 knots, it may be easy for her to outrun her team; excellent map awareness and an eye on positioning of friendly ships is key to playing Tirpitz well, so much so that inexperienced players that fail to consider it quickly earn the ire of their teammates. Many Tirpitz captains will put too much or not enough trust in her armor, either rushing too far forward for a torpedo rush and quickly sinking from a focused enemy barrage, or staying too far back, where her guns are inaccurate, lose power, and make her vulnerable to plunging fire. The key to success with Tirpitz is proper positioning and knowing the right balance for your positioning in a given scenario. Being a German vessel, she was designed and built with the relatively short range battles of the northeast Atlantic and Baltic in mind, not the long range battles of the Pacific. Thus, her armor is a double-edged sword, very thick on the side for short range attacks, but very weak on the deck should a round manage to land and penetrate there. Similar to her cruiser counterparts in the German tech tree, her AP shells far outshine her HE shells, which leave much to be desired. With her handling characteristics, there are two primary ways to drive this ship: either joining the main wave as part of the battle line, or as the capital ship for a cruiser group that did not join the main line to form a flanking unit. One important thing to remember is that Tirpitz has fallen from its place as the top brawler at tier VIII, for a number of reasons. While still a daunting opponent, the addition of the Bismarck means you can no longer be sure of beating anything at close range. With its equal secondary armament (though no longer superior as of the range buff in update 0.6.4) and access to Hydroacoustic Search, the Bismarck is fully capable of outbrawling the Tirpitz. However, If you find yourself in a close range fight, your torpedoes can provide a valuable advantage. But if you intend to utilize a brawling playstyle, remember that you are no longer assured of victory at close range. Tirpitz is a very capable ship in the right hands, and especially inside its torpedo range, is not to be underestimated. However, it has become very difficult to play effectively. With all these things considered, team play and knowing where to be, when to be there, and using her assets effectively when you get there will carry you to victory. Fast turret traverse and main battery reload time (26 seconds) for a battleship. Surprisingly nimble for a battleship of her size, with an excellent top speed (30 knots). Has one quadruple torpedo tube on each side located near amidships. Reminiscent of earlier battleship gameplay: the closer she gets, the more dangerous she becomes to her enemies. Well-protected citadel and impressive durability. Tirpitz B is among the hardest ships in the game to land citadel hits against; most AP shells will land normal penetrations and are thus easier to repair damage from. Lower (for her tier and class) caliber shells result in fewer overpenetrations against broadside cruisers. Only has eight (8) barrels, while every other ship at this tier has nine (9) or more of a higher caliber. Torpedoes only have a 6.0 km range and are vulnerable to frequent incapacitations due to their location on her deck. Anti-aircraft suite is not as strong as that of sister ship Bismarck. Weak deck armor makes Tirpitz B susceptible to plunging fire at long range. Weak torpedo protection, although better than North Carolina. Extremely vulnerable to fires. Superstructures can be set on fire by calibers of any size quite easily. Armor scheme remains vulnerable to full penetrations by armor-piercing shells when showing the flat broadside of the ship to the enemy; may not take citadel damage, but a lot of regular penetration damage hurts just as badly. As a premium ship, Tirpitz doesn't have any upgrades to research. Tirpitz B has access to five Upgrade Slots as a Tier VIII ship. Tirpitz B also has the option of building for Secondaries or for AA. Secondary Battery Build: Following along with the theme of maximizing the punishment dished out by Tirpitz’s secondaries, captains should invest in Basic Firing Training, Expert Marskman, Superintendent, and Advanced Firing Training. Manual Control for Secondary Armament is a strong skill in this build, but it only allows the ship's secondaries to fire at a single target at a time. Some captains will prefer this skill; others will not. Extra skill points should be invested in either Basics of Survivability, High Alert, or Vigilance, as desired. Anti-Aircraft Build: Similar to the secondary-focused build, Basic Firing Training, Expert Marskman, Superintendent, and Advanced Firing Training form the core of the commander skills. Captains then double up on Level 4 skills and pick up Manual Fire Control for AA Armament. German long-range AA batteries are all in excess of 85mm, allowing them to make good use of the skill and dish out extreme punishment to enemy aircraft. A well-played Tirpitz B is likely to find herself under intense enemy fire and captains will want to have access to Repair Party as quickly as possible; thus, Repair Party II ( ) is recommended for the quicker cooldown. The premium version of Damage Control Party ( ) is recommended for similar reasons. As a premium ship, Tirpitz comes included with Type 10 camouflage that lowers her detection radius, reduces the accuracy of incoming shells, and increases the amount of experience she earns. Tirpitz B also has two alternate premium camouflages. The first, "Tarnanstrich", was earned through the Santa's Christmas Convoys event of December 2016 to January 2017; the other is called "Magnu-S", in which she appears as she does during the Halloween scenario "Sunray in the Darkness". Flag of Tirpitz. Given to players who purchased a special bundle containing Tirpitz. Tirpitz in the Ofotfjord/Bogenfjord, circa 1942. Tirpitz was the second of two Bismarck-class battleships built for Nazi Germany's Kriegsmarine (navy) during World War II. Named after Grand Admiral Alfred von Tirpitz, the architect of the Kaiserliche Marine (Imperial Navy), the ship was laid down at the Kriegsmarinewerft Wilhelmshaven in November 1936 and her hull was launched two and a half years later. Work was completed in February 1941, when she was commissioned into the German fleet. Like her sister ship Bismarck, Tirpitz was armed with a main battery of eight 38-centimeter (15-inch) guns in four twin turrets. After a series of wartime modifications she was 2,000 metric tons (2,000 long tons) heavier than Bismarck, making her the heaviest battleship ever built by a European navy. 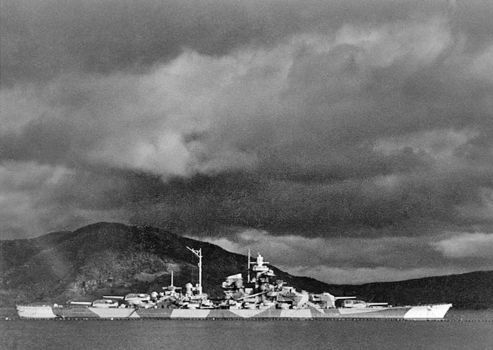 After completing sea trials in early 1941, Tirpitz briefly served as the centerpiece of the Baltic Fleet, which was intended to prevent a possible break-out attempt by the Soviet Baltic Fleet. In early 1942, the ship sailed to Norway to act as a deterrent against an Allied invasion. While stationed in Norway, Tirpitz was also intended to be used to intercept Allied convoys to the Soviet Union, and two such missions were attempted in 1942. Tirpitz acted as a fleet in being, forcing the British Royal Navy to retain significant naval forces in the area to contain the battleship. In September 1943, Tirpitz, along with the battleship Scharnhorst, bombarded Allied positions on Spitzbergen, the only time the ship used her main battery in an offensive role. Shortly thereafter, the ship was damaged in an attack by British mini-submarines and subsequently subjected to a series of large-scale air raids. On 12 November 1944, British Lancaster bombers equipped with 12,000-pound (5,400 kg) "Tallboy" bombs scored two direct hits and a near miss which caused the ship to capsize rapidly. A deck fire spread to the ammunition magazine for one of the main battery turrets, which caused a large explosion. Figures for the number of men killed in the attack range from 950 to 1,204. Between 1948 and 1957 the wreck was broken up by a joint Norwegian and German salvage operation. Tirpitz — at 253.6 meters — is slightly longer than Bismarck’s 250.5 meters due to the former's slightly different bow. However in game they are the same length. Tirpitz sliding down the slipway at her launch, 1 April 1939. Tirpitz camouflaged in the Fættenfjord. Tirpitz under way, probably in 1941. Tirpitz fires her main battery during a gunnery exercise off of Rugen Island, June 1941. Tirpitz, escorted by several destroyers, steaming in the Bogenfjord in October 1942. Tirpitz at anchor in the fjords of Norway, protected by torpedo netting. Tirpitz moored in Kaafjord; the smoke is an artificial fog generated to hide the ship. This page was last modified on 19 February 2019, at 09:53.